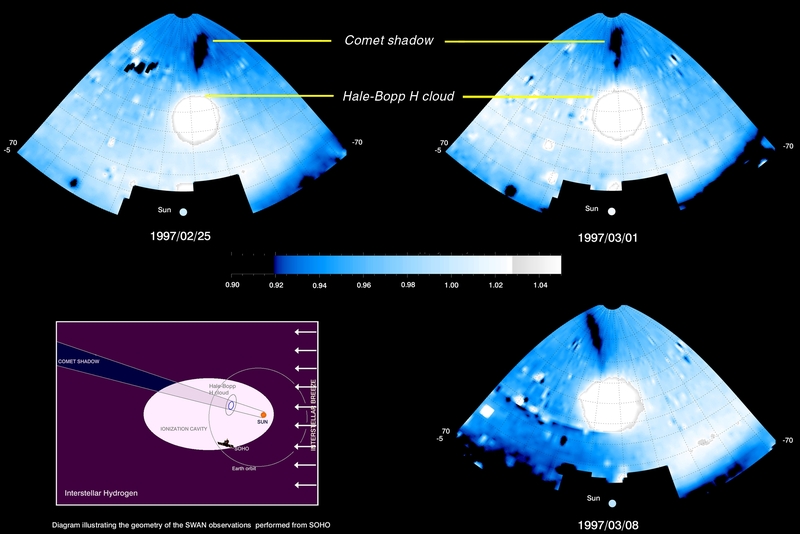 Observation of the shadow of Comet Hale-Bopp by SWAN. Although most of the hydrogen atoms in the Solar System blow in from interste llar space, comets are surrounded by large hydrogen clouds of their own. When co met Hale-Bopp flew near the Sun parading its long tail in 1997, SOHO was already in orbit. In SWAN observations the scientists have now spotted a remarkable fea ture - never before seen by astronomers - the elongated shadow, more than 150 mi es long, of a comet projected on the sky beyond the comet.